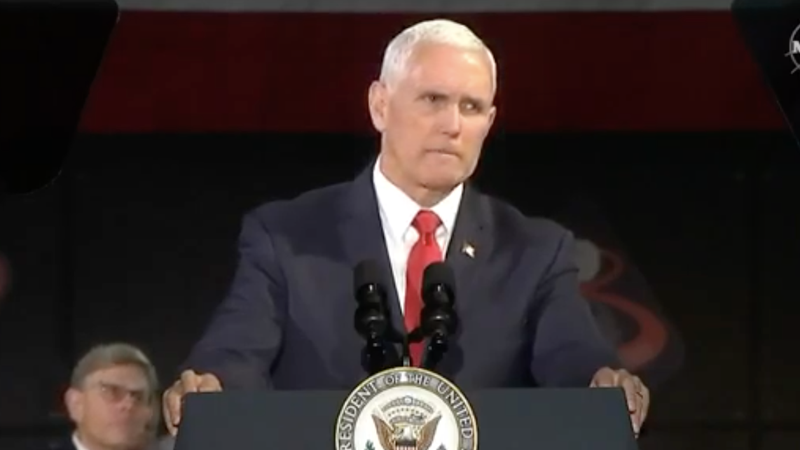 Speaking on behalf of President Donald Trump, Vice President Mike Pence directed NASA to put American astronauts on the moon “within the next five years” at the fifth meeting of the National Space Council on Tuesday. Pence declared that current estimates, which say American astronauts would not walk on the Moon until 2028, were “not good enough.” In language echoing Cold War sentiments, he said that we are once again in a space race against “adversaries” Russia and China. President Trump issued the Space Policy Directive 1, calling upon NASA to return astronauts to the Moon, in December 2017. Frustrated with the lack of a concrete plan, as well as budget overruns and delays from the Space Launch System, Pence announced that NASA should attempt to reach the Moon by any means necessary, even if it means using rockets and landers built by private companies. Pence cited a few reasons to go to the Moon—though the largest is essentially because Americans should be the best, and China has successfully launched its Chang’e series of missions including its lander to the Moon’s far side. He also cited findings of water trapped in the Moon’s permanently shaded polar craters. A human last walked on the Moon in 1972. “Let me be clear the first woman and the next man on the moon will both be American astronauts launched by American rockets from American soil,” Pence said. Pence chaired the fifth meeting of the National Space Council, a group reinstated in 2017 by Trump. The council unites the interests of groups working on commercial, scientific, and national security space operations from a policy perspective. It’s important to note that returning to the Moon will be expensive—one estimate suggested $104 billion in 2005, or almost $135 billion today. Estimates calculate that the Apollo missions cost $120 billion in today’s dollars. Congress appropriated NASA $21.5 billion, more than its $19.9 billion ask, in 2019. The president’s proposed NASA budget includes cuts to scientific programs like the WFIRST telescope and NASA’s Office of STEM Engagement, but does offer over $300 million in funding for developing a lunar lander.